Cucuta, Colombia – Cielo leaves her home in Venezuela at 04:30am every day to get to school in Colombia. For two years now, the 11-year-old student has been crossing into Colombia using the Simon Bolivar foot bridge for access to education as many teachers in her homeland have migrated or refuse to work for the little money the Venezuelan government can pay them since the country’s economic crisis began in 2015. But this bridge, along with others, was blocked off last month for two weeks by Venezuelan President Nicolas Maduro after Juan Guaido , the opposition leader and self-declared interim president, attempted to lead a US-backed aid caravan across the border. Maduro, who has routinely denied that there is a humanitarian crisis in the country, maintains the aid is a ruse to remove him from power. After days of protests by parents and children on the Venezuelan side of the border, a “humanitarian passage” was opened on Monday, allowing only schoolchildren and the critically ill to cross into Colombia using the formal border bridges. This border closure led to an emergence of informal crossings, known locally as “trochas”, that are dangerous and controlled by armed groups from both countries charging people money to pass through them. Venezuelans need to cross into Colombia to buy basic items that are scarce in Venezuela, like food and medicine, or, in Cielo’s case, to get an education. Even though the bridge is now open for certain groups, the Venezuelan National Guard does not let parents cross with their children, who must go alone. People are also not allowed to transport products from Colombia into Venezuela on the bridges. The young student, a biology and sports lover, said she did not like using the trochas, but more importantly for her, she did not want to miss school. 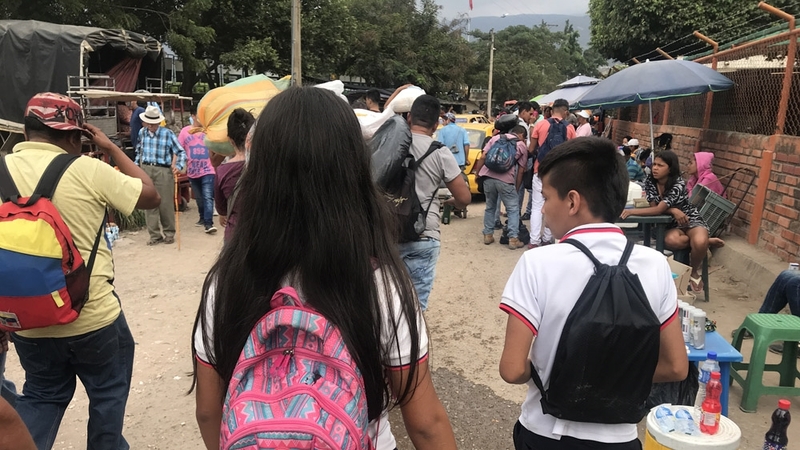 “Sometimes we have to run to get through [the trochas] because they close them off,” Cielo said, walking her way to the crossing through the bustling border town of Cucuta after school, dressed in her school uniform. “It’s very dangerous. People say there are paramilitaries and guerrillas and sometimes there are confrontations”. 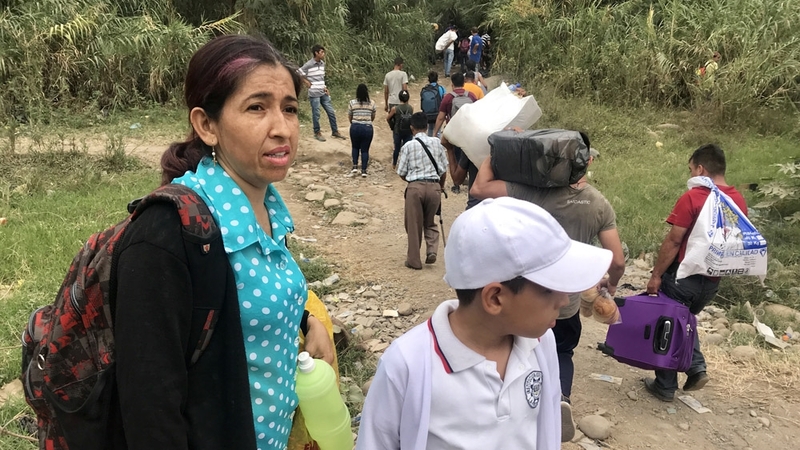 Upon arrival to the narrow and overcrowded trocha, Cielo weaved her small body through the masses of people frantically trying to return to Venezuela, hauling heavy bags and suitcases filled with supplies bought in Colombia. People shout “make way” as they rush through with entire sacks of potatoes on their heads, while others get knocked down or to the side. Children as young as eight stand by the river, asking for money in exchange for helping people cross it with their bags. On the other side, Venezuelan armed groups collect money to allow people to continue to use the trocha. One mother, Dayanera Diaz, 42, takes turns with her sister each day to walk their children to school from Venezuela to Colombia. She was doing the return journey will her son and nephew a week ago. She said she had to pay to pass through, but they did not charge the children. “When the bridge is open they go to school by themselves, but now that it’s closed, it’s too dangerous,” said Diaz, who was also carrying rice and meat back with her. Laidy Gomez, governor of the Tachira border region, deemed the measure of not letting Venezuelans pass through the border bridges with basic food and supplies for their families “inhumane”. On Tuesday, members of the opposition asked Michelle Bachelet, the United Nations high commissioner for human rights, to visit the informal crossings. Cielo attends the “mega school” on the border with about 2,500 other students. Nearly half – 1,200 – are Venezuelans or “returning” Colombians, who left during during Colombia’s five-decade-long armed conflict and have now come back since Venezuela’s economic downfall. “It’s unbelievable that only five out of 1,200 children came to class the day after the closure, who used to pass by without problems,” said German Berbesi, the school’s headteacher. “For some, it was out of fear of the illegal armed groups, and for others, because the Venezuelan National Guard or the guerillas and paramilitary groups didn’t let them cross”. Berbesi criticised the governments of the United States and Colombia, as well as Venezuela’s opposition, for disappearing after their “failed attempt” to get aid into Venezuela. “Now the borders are closed and our children are left stranded, where is our president, our governors, our mayor? Where is [US] President [Donald] Trump’s help now?” he said. The headteacher said attendance numbers have have gone down dramatically since the border closed and now there are about 850 of the 1,200 Venezuelans or “returning” Colombians attending. Before, most of these students would hardly miss a day as spots in the school are in high demand. “In the trochas, the children are always at risk. Parents call to say they aren’t sending their child because they’re scared for them. What can I say? I can’t force them to send them in case something happens to them,” Berbesi said. One of the main reasons for the reopening of the bridge for children and the sick was because the river they had to cross has risen in recent days due to rainfall, making the trek even more difficult. “I have a friend who’s missed two weeks and I know others who are coming up to three weeks,” said Cielo. The Norwegian Refugee Council (NRC) – a group devoted to protecting the rights of people affected by displacement – said some 4,000 boys and girls who cross the border every day to get an education in Colombia have not been able to continue with their classes because of the border closure. “In spite of the situation, some children are walking through irregular crossings to reach schools, exposing themselves to the protection risks, including those associated with non-state armed groups that are part of the conflict in Colombia,” Christian Visnes, NRC Colombia country director, told Al Jazeera. 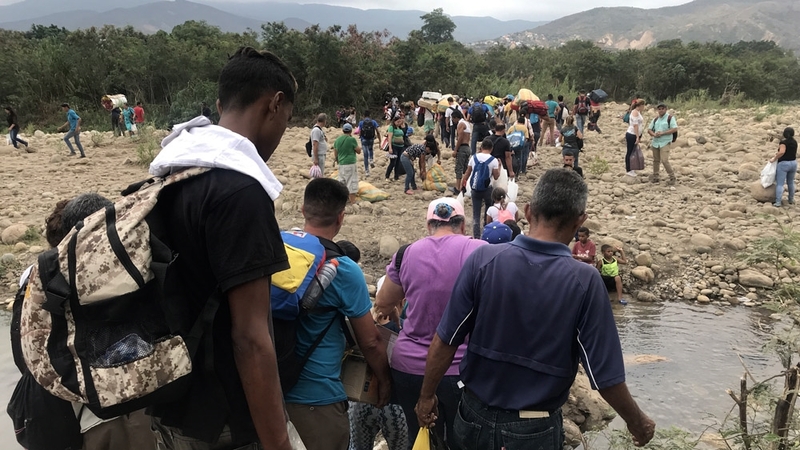 Venezuela’s closure of the border has mainly affected its own people, according to Felipe Munoz, the Colombian government’s director of border issues. “There are 3,218 Venezuelan children who are collected in Colombian buses every day and brought to school so they can study and eat and that is not able to happen now,” Munoz said, referring mainly to children who live in further away towns. Cielo said she would continue to make her daunting walk to school through the trochas for now, but hoped for change. “The time I leave in the morning it’s really dark and feels dangerous. It’s all bushes and sometimes when I get there, they haven’t even opened the trochas yet,” the 11-year-old said.